Come experience a delightful evening of song with the incredibly talented and lovely Saige Carlson. Saige will perform a selection of classical vocal pieces from the repertoire she is taking to The CFMTA National Convention Voice Competition finals in Halifax, Nova Scotia next month. Saige will be representing all of BC at this competition organized by the Canadian Federation of Music Teachers’ Associations. Saige will be accompanied by the well known and renowned pianist, Mr. Dennis Nordlund. This is a fund- raising event designed to help Saige travel and compete at one of the highest levels of vocal excellence in our nation. This is the big stage and this is a young woman from our midst. Please come and support her and treat yourself to a wonderful talent. 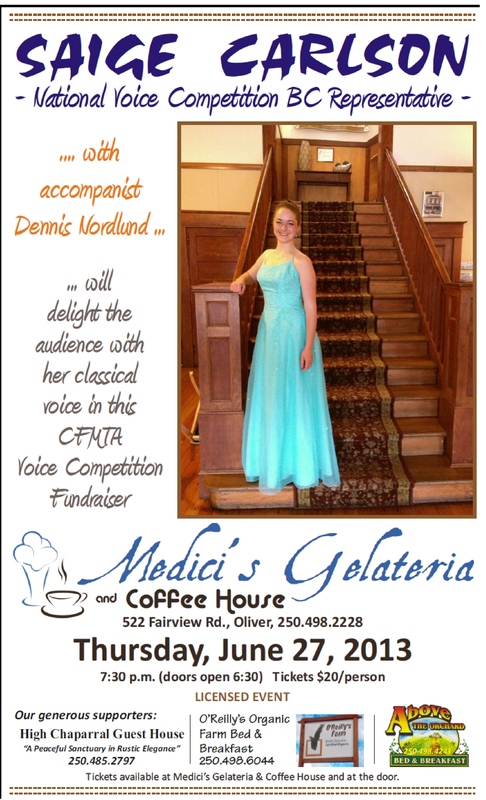 If you are unable to attend, there will also be a recital at the Lakeside Resort on Sunday June 23rd at 4:30 PM. This entry was posted in Main and tagged CFMTA, competition, music, National, Saige carlson, soprano, talent, vocal, youth by admin. Bookmark the permalink.